Ninja Theory, developer of Heavenly Sword and DMC; Devil May Cry, has released a new trailer for Hellblade, its upcoming third-person action game. Along with the trailer, which you can watch below, Ninja Theory has also discussed some of the themes at the heart of the game. Mental health and psychosis are the key themes explored in Hellblade," the studio said. In order to accurately and authentically explore these themes, the studio is working closely with Paul Fletcher, University of Cambridge's professor of health and neuroscience. Ninja Theory is also consulting with people who have an experience of mental health difficulties. "True understanding of mental health is not simply about the books, lectures, or verbal descriptions but from deeper engagement on all levels," said Fletcher. "Working with Ninja Theory has shown me the potential that gaming has for sharing in a character's experiences and engendering empathy in ways that go well beyond those offered by simple academic descriptions. Maybe this approach will contribute powerful new ways of challenging stigma." Tameem Antoniades, Ninja Theory's chief creative officer, added that the studio is "pursuing creative independence in order to explore a compelling subject matter and gaming experiences that would not be possible under the current retail model." "In movie terms," he continued, "this would be a quality independent film, not a Hollywood blockbuster. Digital self-publishing means that we can offer a smaller, but high-quality game at around half the price of retail games." Ninja Theory has also revealed that the project is supported by the Wellcome Trust, a charitable foundation aimed at improving the understanding of science and health. The studio has said Hellblade will deliver "ninja-class melee gameplay, strong character stories, and a unique art vision"--it was easy to assume this was, at the very least, a spiritual successor to Heavenly Sword. But even that isn't the case. Not sure what this is, but I like it. From what I gather, it is a dark, disturbing, character driven, hack & slash game. To me, it kind of seems like Heavy Rain meets Silent Hill 2 meets God of War(or Heavenly Sword). I thought these guys were just gonna make mobile games from now on? Guess that tune changed. Confusing trailer, will wait for actual gameplay. Nah. They are very much into console gaming still, and was never going mobile only. Looks kind of intriguing. Main character is insane. I'm not a big fan of dark, gloomy games, so I don't know if it's going to be for me. But apparently Ninja Theory has done some good action games in the past (Heavenly Sword, DMC), so maybe the combat will be fun. I like that they're keeping the budget low and offering a smaller, story-driven package for $30. I heard they said the game is shorter than a normal SP campaign, so I'm guessing it'll be in the neighborhood of 6 hours, give or take. I loved Heavenly Sword. But this looks like a female version of Ryse. Even though I did enjoy Ryse. I'll rent this for sure. Edit: after listening to that video, I'm out on this one. It sounds like combat is one on one Infinity Blade style. Uses these words to describe it: "intense," "bizarre," "aggressively swirling intensity," "horror," and "f*cked up"
Mental illness translated into a videogame; a more realistic treatment of that than in the past. A very different sort of game. "Bold" choices. "Strong voice" and vision; "not focused tested." These guys did Enslaved, too. They typically specialize in "stylish action" games, but the combat here is pared down, no combos or skill trees, and the game is much more story/experiential focused than their previous ones. Still not sure if it's for me or not. I like the inventiveness, the story/experiential focus, the price tag, the strong vision, and how different it sounds. The main negative would be the dark themes and the "intense" or "horror" tone -- I don't typically like games like that. Otoh, that is an attempt to portray mental illness (psychosis), which I find interesting. So I don't know, but I've got my eye on it. Still not sure if it's for me or not. I like the inventiveness, the story/experiential focus, the price tag, the strong vision, and how different it sounds. The main negative would be the dark themes and the "intense" or "horror" tone -- I don't typically like games like that. Otoh, that is an attempt to portray mental illness (psychosis), which is interesting. Yeah this thread has me wanting to keep an eye on it as well. Strange concept. But it could be cool. It's certainly pretty. Yeah combat of their games have always been weird or too simplistic. I just noticed that the "concerns" video I posted in the OP was done in Sept 2015 -- almost 2 years ago. I've deleted it. Soounds like they have no idea how to talk about this game. It does sound inntresting though. I enjoyed Enslaved but never played Heavenly Sword or the new DmC. I don't like the title, "Hellblade." It sounds dumb. I never paid the game any attention, because I figured, with a title like "Hellblade," it was just a generic hack-and-slash, trying too hard to be cool. I only realized the game had something interesting going on when I read an article about upcoming exclusives, where the author called it "a story-driven, psychological action-adventure" (wait, what now?). I don't think naming it "Hellblade" did the game any favors. It might make it harder for the game to find its audience. If I were them, I would've come up with something more imaginative. Psycho B*tch and the Sword of Psychosis, something like that. I don't think naming it "Hellblade" did the game any favors. It might make it harder for it to find its audience. If I were them, I would've come up with something more imaginative. Psycho B*tch and the Sword of Psychosis, something like that. You need to copyright Sword of Psychosis right now!! Yeah that's a much better name. Just heard this was a digital-only title. I'm out. $30 digital = $60 retail for me. Defeats the purpose of the lower price point, at least from my perspective. It's a value investment. Do you think you'd get 30 bucks entertainment out of it? That's always the question I ask myself when I'm not sure of a purchase or buying something on sale. I'll be interested in seeing the reviews. It's an ambitious and interesting game. I gotcha. That's the question I ask when I'm buying a $60 retail game, too. Am I going to get $30 worth of fun out of this? I'm just saying, a big part of the appeal of this game (for me) was the lower price point and their whole philosophy around that. But because they're only offering it in digital format, that appeal is gone. So now I'm now looking at the game as if it is a $60 new release title (because the cost ends up the same). I'm judging it by that standard, rather than a "half price" game. I get why they're doing it. It's a lot more lucrative for them. I don't have any problem with them doing it. It just reduces the value proposition considerably, for me, when you don't allow me to recoup any of the cost by selling the game. I don't quite understand why 30 bucks equals 60 bucks? Is it because it's digital only? If so then yeah, I can understand. If your into trade ins then it's a negative. I've been burned on a few digitals where I definitely didn't get my investment back, even if that was only 10 bucks. Yeah, $60 retail = $30 actual cost, because I can recoup $30 by selling the game when I'm done. I sell off about 90% of my games, even if I like them. With digital, I don't have that option, so $30 digital = $30. That's why $60 retail = $30 digital, at least in my little world. It was The Witness that did it for me, made me realize how burned I felt by buying something digital. I spent like an hour on it, didn't like it, and then thought to myself, "Well, there goes $30 down the drain." Understand, I am not a poor man. I am however a cheap man. Preach it, brother. I'm exactly the same way. I bought The Dwarves on my PS4 for 10 bucks and it was so f***ing bad I was kind shocked a game like it could actually be sold. Even though it was ten bucks and I usually spend more than that on games each month I was still pissed I'd blown a whole ten bucks on it. If it makes you feel any better I'll probably pick this up so i can drop you some feedback on it if I do. I try to get $1 per hour of gameplay. That is the absolute best outcome though but realistically even $2 or $3 is pretty good in my opinion. Some games I'll easily eclipse that, others obviously short when it's a 10 hour game. I've tried to be more careful this gen though as Xbox has been digital only and PS4 I have only ended up trading in a couple games. I think this one is supposed to be like 6 hours or so. Not really sure, but that's a best guess. edit: More like 8 hrs. Only 6 hours. Not bad for $30 i guess. 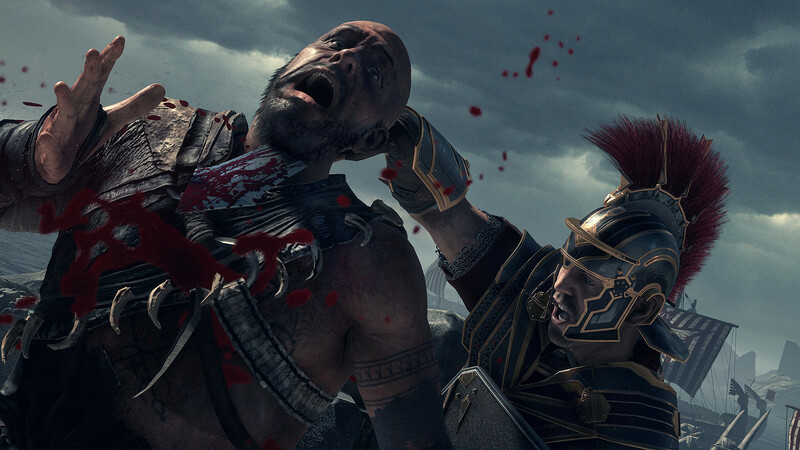 If it's like Ryse or Heavenly Sword i can get into that, i enjoyed both but they obviously had their downside. It really gives me RYSE vibes in the art and rendering. Especially the Norther tribesmen. Devs say it'll be 6 to 8 hours. Probably means 10 for me.